Graduates will have gained a survey knowledge of both the Old and New Testaments. Graduates will demonstrate hermeneutical skills with facility in at least one of the biblical languages. Graduates will have the ability to apply biblical truth to life and ministry. The Master of Biblical Studies (MBS) is a graduate-level academic degree program designed to equip students with the skills for in-depth study and interpretation of the Bible. 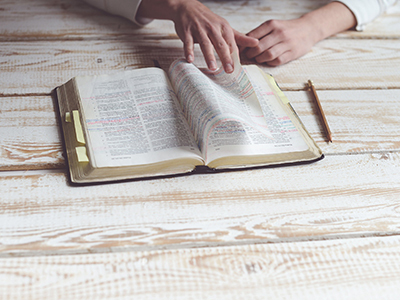 Designed with a high standard of academic rigor, the focus of the degree is to gain biblical content knowledge and skills in biblical interpretation. As such, the MBS would be of most interest to students desiring to increase their knowledge and appreciation of the Christian Scriptures through intensive study. This program would thus strengthen lay people and leaders serving in church, para-church, or other mission agencies. Typical completion time is 2-3 years full-time. The prerequisite for this degree is a B.A. degree, or its equivalent, from an accredited college or university. A cumulative grade point average (GPA) of 3.3 in bachelor’s degree study, or if transferring into the MBS degree at the master’s level, a cumulative gpa of 3.3 from both bachelor’s and master’s level study. Students need to maintain a GPA of 3.0 throughout this degree program. A total of 48 credit hours is required for the completion of the degree.